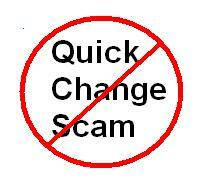 Quick change scam is when an individual target inexperienced cashiers by paying for small priced items with a large bill ($50). Before the cashier could give back the change the suspect would engage the cashier in a speedy series of money exchanges thereby confusing the cashier. In the confusion suspect would tell the cashier how much money to give back thus short changing the cashier. In some instances suspect(s) work in teams of two where one suspect would handle the money exchange while the second suspect act as a distraction to confuse the cashier even more. Detectives suggest to avoid being a victim to the scam, only complete the transaction for the purchase then close the cash register. If the customer is asking to exchange bills be weary of the scam and contact your manager before engaging in further interactions. If you become a victim to the scam report it to the police along with a detailed physical description including clothing of the suspect(s). Ensure that any security video footage is saved and submitted with your report to the authorities. If you have information about the identity of the suspect, or any other criminal activity call Crime Stoppers toll-free at 1-800-222-8477(TIPS).